John Gerwin, Bird Curator at the NC Museum of Natural Sciences and Friend of SEANET (F.o.S.) has sent along a few seabirdy tidbits and this first one caught my eye right away: the discovery of a new species of bird? In this modern age? Indeed, it’s true. The diminutive Bryan’s Shearwater was only just identified as distinct from all the world’s other shearwaters. While explorers continue to discover new species of smaller organisms daily (insects, bacteria, nematodes and the like) new bird species are all but unheard of, having declined sharply after the Golden Age of Victorian gentleman naturalists. 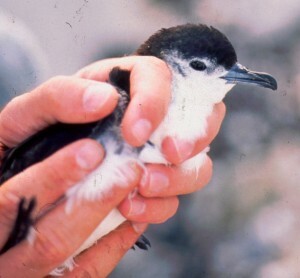 Back in 1963, a tiny shearwater specimen was collected from a burrow in a petrel colony on Midway Atoll in Northwestern Hawaii. At the time, the bird was not recognized as anything new and was presumed to be a particularly small individual of a known species. Only last year, ornithologist Peter Pyle examined the specimen and declared it distinct in several features from any known shearwater species. After his findings, DNA from the specimen was submitted to the Smithsonian Conservation Biology Institute, and analysis there revealed it is genetically distinct from any known species as well. At that point, the bird received its new moniker, the Bryan’s Shearwater, for Edwin Horace Bryan Jr., who was curator of collections at the B.P. Bishop Museum in Honolulu from 1919 until 1968. After the identification, focus shifted to determining whether the species still exists anywhere in the world. Sure enough, Japanese researchers reported 6 specimens on the Ogasawara Islands. Five were found dead between 1997 and 2011, and the sole living specimen died in a rehabilitation facility. The researchers in Japan believe there may be over a hundred of the birds on the island, but fear that the island’s introduced rat population may be taking a serious toll on the birds if they attempt to breed. Rats will consume the eggs and chicks of burrow or ground-nesting birds, and sometimes even kill adults. Rat eradication is difficult and expensive, but if the Bryan’s Shearwater is proven to breed on these islands, there won’t be any alternative but to try to protect this rare, newly discovered bird by every available means. This is a story we will follow with interest, despite its Pacific origins. After all, a new, rare species that may still be hanging on despite terrible odds is something to root for. Turns out you have to get up pretty early in the morning to fool devotees of the Dead Bird Quiz. Both Wouter and Dennis detected my ruse, that these three pictures represented fewer than three distinct species. In fact, as Dennis correctly answered, the first two birds were both Bufflehead (A was a male, and B was a female), and the last bird a Common Goldeneye. Both species are small ducks, with the Goldeneye’s wing chord ranging from 19-24cm, and the diminutive Bufflehead’s merely 14-18cm. To walk through the i.d., what we have here are three dark wings, each with some degree of white on the upper surface. Alcids (murres, dovekies, and such) have a dark wing, but the white is limited to the very tips of the secondary feathers and does not extend over the wing’s upper surface. So those guys are out. That leaves the Red-necked Grebe and the small ducks (Bufflehead and Goldeneye). The Red-necked Grebe can be ruled out by the lack of a white leading edge in the crook of the elbow of the wing. RNGRs thus have two distinct white patches on the upperwing–one on the leading edge close to the body, and the other on the trailing edge farther out along the secondary feathers. Red-necked Grebe: note two separate white patches on upper wing. 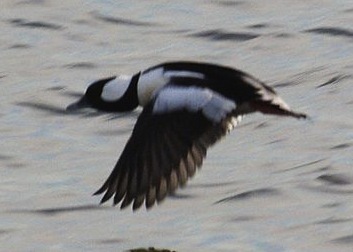 Male Bufflehead; white extends almost to leading edge of wing. The best differentiating feature between our remaining candidates, the Bufflehead and Common Goldeneye, is size. Goldeneyes will invariably have a longer wing chord, if the measurements are taken very carefully. But if measurements are not available, then it can be a challenge to make the call between male Bufflehead and male Common Goldeneye in particular, if only the wings remain. In general, the white band on the upperwing extends a bit farther forward on the Bufflehead, but without having them side by side, that’s a tough comparison to make. All the more argument for taking careful, accurate wing chord measurements; it can be the difference between an i.d. and “Unknown duck” in the database, after all. 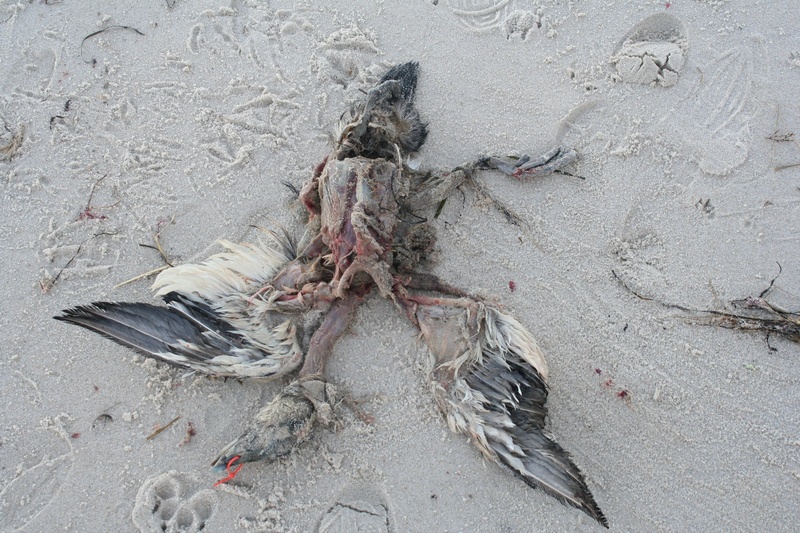 Here you go–the latest Dead Bird Quiz. Two of the specimens are from Becky Bartel’s beach in North Carolina, and I was fortunate to be along for the finds. All three specimens in this quiz have wing chords around 18cm. Post your answers as comments, and you’ll hear from me next week. 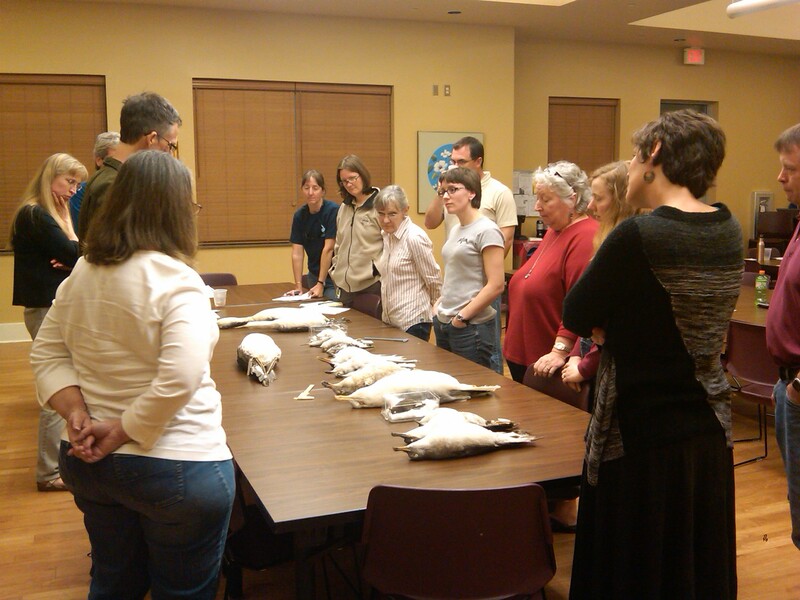 The assembled crowd listens as John Gerwin shows museum specimens of common N.C. seabirds. After a full day of travel yesterday, I staggered into the town of Manteo, NC on Roanoke Island just in time to give the SEANET spiel to about a dozen assembled personages. The workshop was organized in fine fashion by dear friend of SEANET John Stanton, and by Becky Bartel, who, along with John, is in the employ of the US Fish and Wildlife Service. It seems the USFWS grows dearer to me everyday. In any case, the crowd last night was engaged, curious, and it appears we have a few new recruits among them to walk some of these very fine beaches here in North Carolina. John Gerwin, Curator of Birds at the NC Museum of Natural Sciences, made the trek from Raleigh to bring a selection of prepared bird skins for the attendees to examine and handle. Several of the avid birders in the crowd began to appreciate that a bird looks very different when dead than when alive, illustrating once again the strange and valuable skill set of dead bird i.d. that we Seanetters cultivate. After the evening’s festivities, and a solid night’s sleep, I had the distinct pleasure of joining Becky on her SEANET walk at Pea Island National Wildlife Refuge. Dolphins were cruising close in to shore, endless lines of cormorants were streaming up over the southern horizon (see video). “Where are they all coming from?” I exclaimed, and Becky answered grimly, “The underworld.” Evidently she has the requisite morbid sense of humor to be a Seanetter. 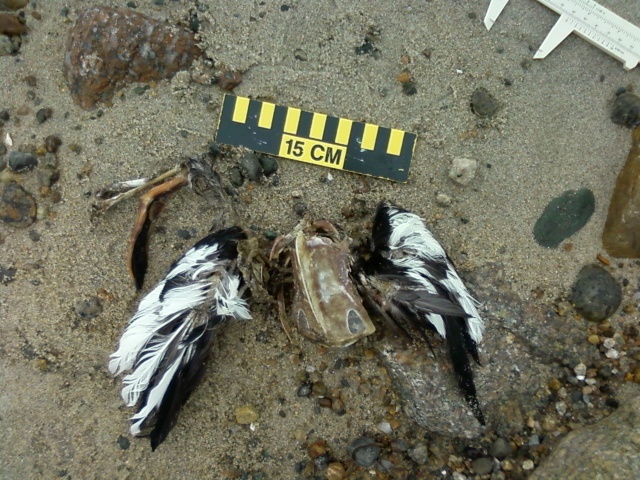 Becky also found her first intact carcass, complete with head: a Common Loon. She also found a couple of wings whose identity I shall keep secret lest they appear in an upcoming dead bird quiz. 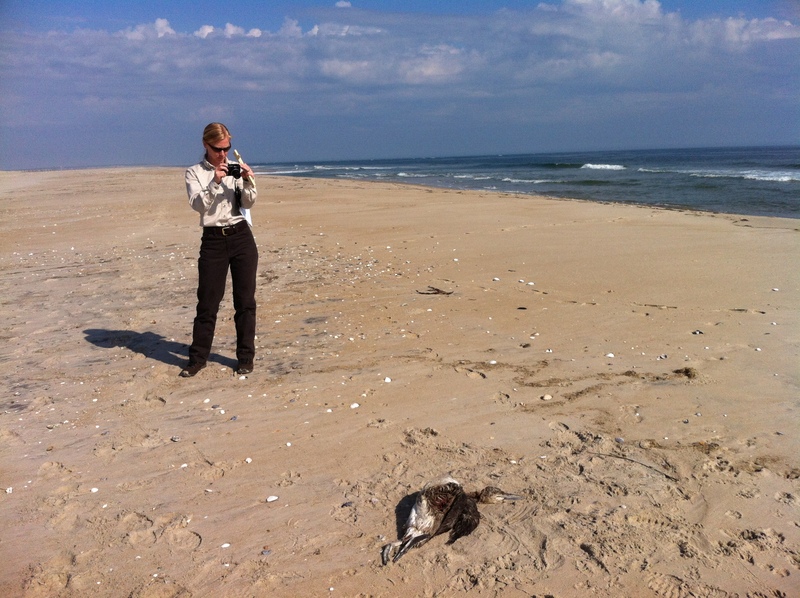 Becky Bartel takes an initial photo of a dead loon on her Pea Island beach. I have every confidence that between Becky and John, SEANET-North Carolina will thrive. This is bittersweet for me, of course, because it means no more trips down south for the foreseeable future. Alas. So tomorrow, it’s back to New England for me, where, admittedly, the weather has been lovely, so I hardly have anything to complain about. Thanks Becky, John Stanton, and John Gerwin, and thanks to all who attended last night–hope to hear from you all soon! A brief article just out in Biological Letters indicates that Northern Gannets visit and overwinter in the Gulf of Mexico more than previous banding studies had indicated. The article describes the use of GPS locator tags to track the movements of gannets from their breeding grounds in Canada. 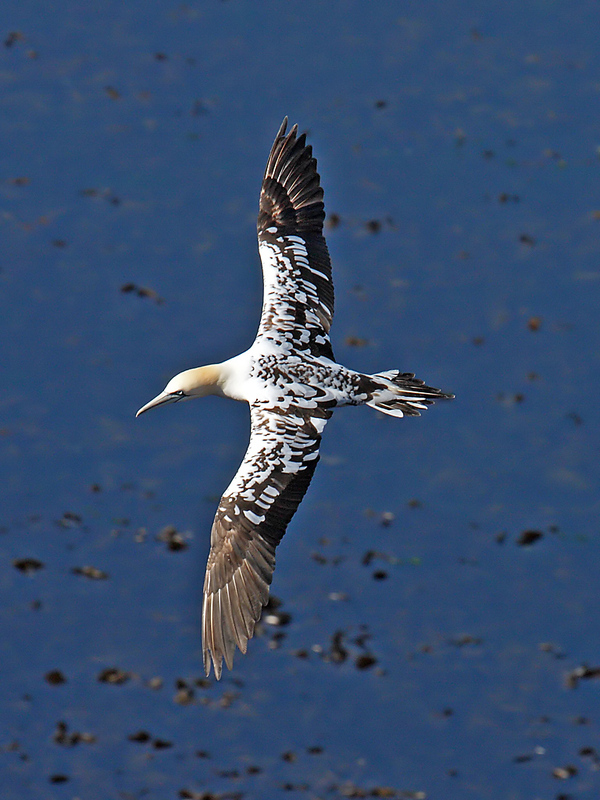 The researchers demonstrated that about 25% of the North American gannet population utilizes the Gulf at some point. 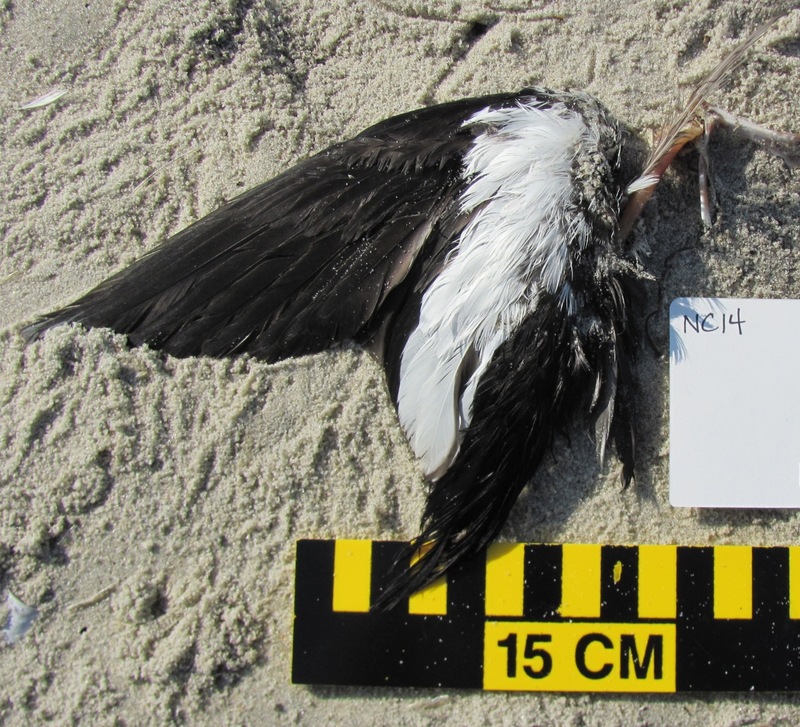 The impetus for this study was largely the BP Deepwater Horizon spill, in which Northern Gannets were number one in terms of percentages of bird species found oiled after the disaster. But the population level impacts of the spill were difficult to extrapolate without a clear sense of how many gannets were likely in the area at the time. In April, when the spill began, most adult gannets would have headed north to the breeding grounds. But approximately 50,000 immature birds, ranging in age from one to five years old, have no reason to hurry away from the Gulf’s waters. It’s this younger age group that was likely most severely impacted by the spill. As a result, it’s difficult to predict the long-term population effects on this species. Juveniles have a high mortality rate anyway, and, in terms of breeding, are less valuable to the population than established, experienced breeders who can produce new chicks for more than a decade. The authors of the study suggest that future years may show a subtle, lag decline in the numbers of gannets, reflecting the hit they took during the spill year, or there may, in fact, be no perceptible effect on the population. This is good news for the gannets, but this study also drives home the need for these more expensive tracking studies to supplement cheaper, but larger scale, banding efforts. In fact, estimates of the number of gannets using the Gulf based on the geo-locator data are more than twice the estimates based on band data. This means that estimates of spill-related mortality would be similarly skewed if scientists rely solely on band recoveries. The two types of studies can be complementary, and events like the BP spill demonstrate the need for continued monitoring of the marine birds, even ones as seemingly “safe” as the ubiquitous gannet. It’s when we look away that everything seems to fall apart. Your SEANET blogger was graciously offered a speaking slot at the Cape Cod Natural History Conference this past weekend. The conference, organized by Mass Audubon, is in its 17th year and offered presentations and posters from a wide range of environmental, conservation, and scientific groups. My talk on the causes of Common Eider die-offs on the Cape was well-received, though the local audience was much chagrined to find out that the virus afflicting the birds has been named Wellfleet Bay Virus, the eponymous pathogen bringing some degree of infamy down on a lovely body of water. My thanks to Melissa Lowe Cestaro and Bob Prescott for coordinating and emceeing the event, respectively, and thanks to the now super-famous Seanetter Dennis Minsky for attending my talk–good to see you, as always! We’ve been most gratified as well to discover that an article about the Common Eider die-offs by Doug Fraser of the Cape Cod Times could be found front page, above the fold in advance of the conference. My hat goes off to Doug, who gives a very thorough write-up here–he’s clearly a scientist’s reporter! Open pipes are bird death traps! 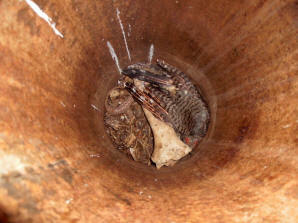 Dead Northern Flicker and miscellaneous bones found in an uncapped pipe. 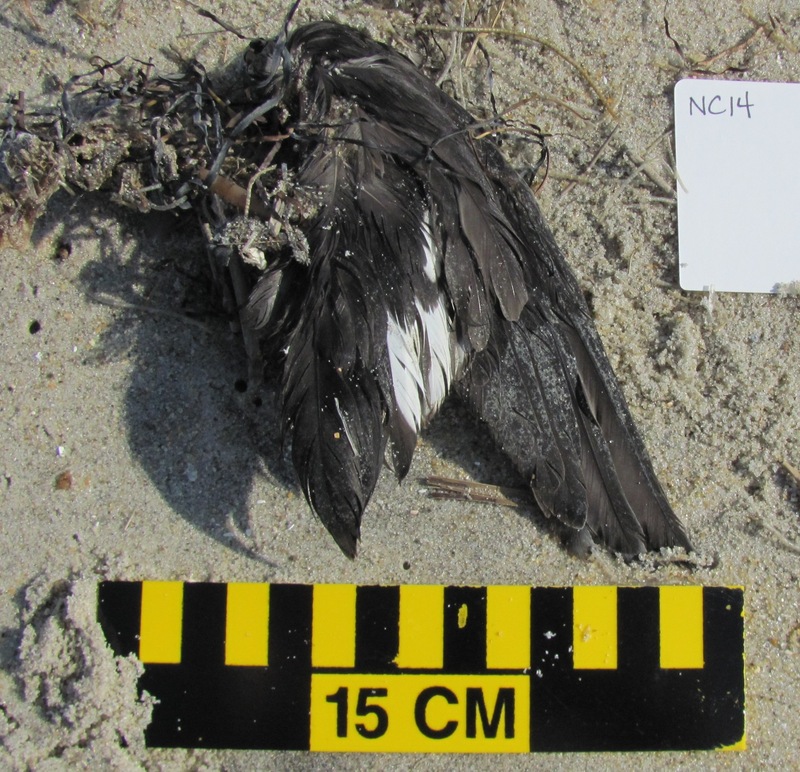 Sean Rowe, Land Steward at the Kern River Audubon Preserve in California, contacted us recently about a deadly threat hiding in plain sight that has killed millions of birds. In fact, you may have several of these death traps on your home alone. The issue seems to have been noted first out west, where the uncapped PVC pipes used to mark mining claims were found to contain countless dead birds and mummified bird parts–sometimes several years’ worth of birds who made the fatal error of exploring a smooth sided pipe. Any open-topped pipe of any material poses a threat–plumbing vents, metal fence posts, septic vent pipes–if it’s an uncapped tube, it can entrap birds. Sean sent us some great information on the issue, and the simple steps you can take to address it on your own property. Sean particularly contacted SEANET because of our involvement with monofilament fishing line recycling. The “bins” we use for this are in fact upright PVC tubes with a horizontally facing opening to receive discarded fishing line. One could imagine that a horizontal opening might resemble a potential nest cavity even more strongly than a vertical opening to a bird, and moreover, these receptacles cannot be permanently capped since they must constantly receive discarded line. So far, none of our volunteers monitoring these bins have found a dead bird inside, but we recommend retrofitting the bins to prevent any future entrapments. The Missouri Department of Conservation has a plan available for modifying the bins, and it seems like a pretty simple fix. For those of you not maintaining a bin, please help by capping pipes and vents on and around your home, and help us spread the word to friends and family. Thanks to Sean for bringing this issue to our attention. The law of unintended consequences has a long reach indeed!